KARLSRUHE, February 2018 / in70mm.com news. 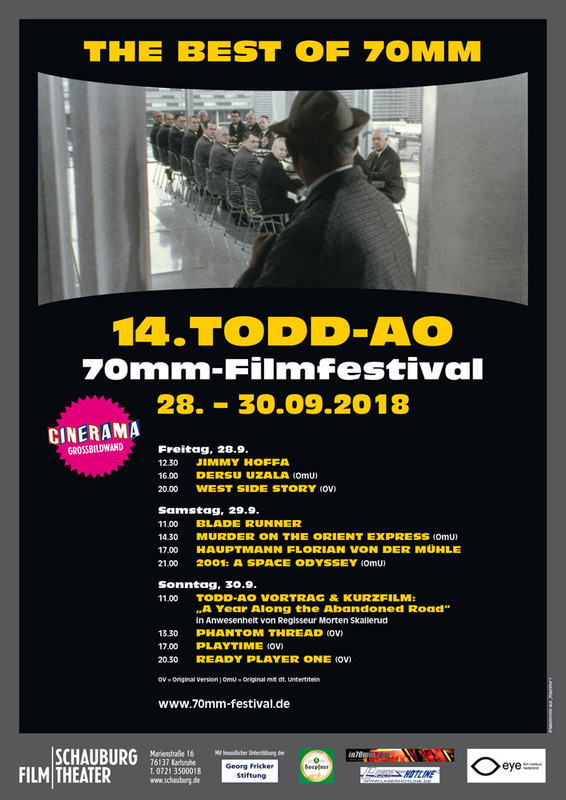 We have started planning of the 14th instalment of the “Todd-AO 70mm Festival“ to be held from 28 - 30. September, 2018 at the Schauburg Cinerama in Karlsruhe, in the south West of Germany. The 14th Festival is headlined "The Best of 70mm", and we hope to present a bouquet of titles, which we think represent 70mm at it's very best. Old classics, rarely seen epics and popular titles, short films, as well as some of the latest releases in the grandest of formats, including "Murder on the Orient Express" in the splendour of 7OMM. 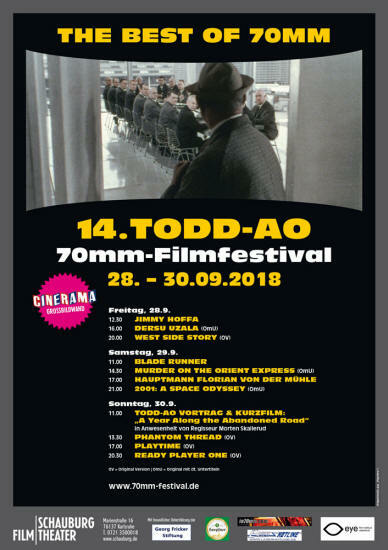 For three days in September Filmtheater Schauburg celebrates the world of LARGE FORMAT film, by offering a series of epic films in 70mm - the Ultra HD of film formats. The Todd-AO Festival at the Schauburg is about going to the movies in style. Seeing the films at the Schauburg is like seeing the films as they were originally presented - in a big cinema, on a huge curved screen with red curtains. It's all about showmanship and presentation, and very few cinemas today - if any - do it better than the staff of the Schauburg. Join us and be part of this unique event and share the excitement together with visitors from all around the world - including Austria, Switzerland, Holland, Germany, Denmark, England, Norway, Czech Republic, USA, Japan, Sweden and France - and hopefully many more. Some films are in their original English versions and some "70mm Vintage Classics", are dubbed into German. Due to the age of the prints, many have lost their color and are faded. But they are ORIGINAL premiere 70mm prints from the 1960s. Like all modern cinemas, The Schauburg enjoys the benefits and advantages of digital projection technology, but the "Todd-AO Festival Policy" is simple. NO DIGITAL! No compromise at the Schauburg where 70mm is concerned! That is our Todd-AO Festival hall mark, as we honour 60 years of 70mm projectionist tradition, and present film as they were meant to be presented, on genuine 70MM film, done by real people. From vintage classics to the latest Roadshow 70mm films, all of which proudly carry trade names of large format motion picture processes. The festival is much more than 70mm films. Enjoy Schauburg's famous breakfast buffet, listen to lectures and witness a special section with rarely seen 70mm short films. On Friday night, festival sponsor the local brewery Hoepfner traditionally hosts a ”Hoepfner Get together” with free beers. Included in the ticket is also the 40-48 page full-color printed souvenir program especially made for the Todd-AO Festival. It includes detailed information and pictures of the films shown, as well as an article or two, relevant to the weekend. A treasure to take home and keep. All free of charge and included in the festival ticket. One of very few original cinemas, still equipped with 70mm projectors. A new Harkness screen was installed for the 11th Todd-AO Festival in 2015. The screen is 16,15 meters wide along the curve, screen chord is 14 meters, Todd-AO height is 6,4 meters, and the depth of the screen is 3,45 meters. Projection distance is 23,8 meters, radius is 8,8 meters and screen curvature is approximately 105 degrees. The curved screen has both vertical and horizontal moveable masking and covered with a "Cinerama red" curtain. 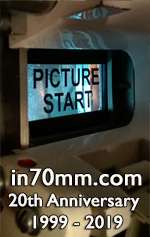 • "in 70mm" is unlike anything you have ever seen - a High Definition movie experience with extremely sharp images and crystal clear 6 track stereo. • "in 70mm" is very realistic, almost three dimensional and can make everything you have ever seen pale into insignificance. But don't take our word for it - come and see for your self. All 70mm films will be projected by vintage and historically correct Philips DP70 and DP75 projectors. Magnetic sound reproduction by SCS preamplifiers, sound format dependent noise reduction by Dolby A/SR circuits. Auditorium sound presentation by state of the art Alcon speakers. "No expenses are spared to give you the very best experience. ", says Herbert Born, and he continues: "It is a Harkness Perlux 140 with a 1,4 gain which helps to reduce the cross reflections of the deeply curved Cinerama screen at the Schauburg." 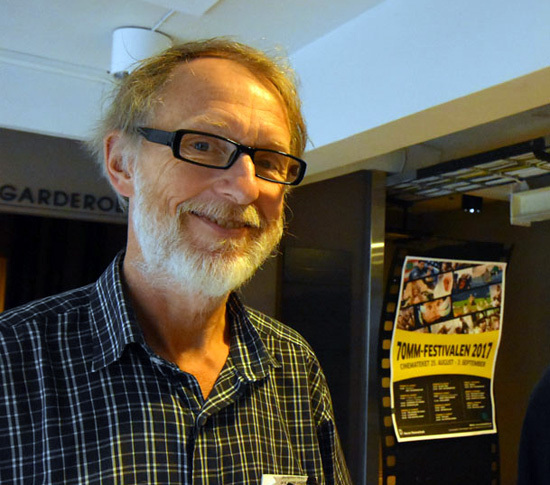 We are delighted to announce the presence of Norwegian film maker, Morten Skallerud, who have accepted our invitation to participate the 14th Todd-AO Festival. We are bringing his multi-award winning 70mm short film from 1992 back for a second viewing, in case you missed it in 2005. "A Year Along the Abandoned Road", presented in 6-track magnetic Dolby Stereo. Morten will be available throughout the weekend, and he will introduce his short film. We are equally delighted to announce the presence of Tommy Madsen's new ultra-light Magellan 65 Camera. Tommy has agreed to lend us a camera for the weekend, which will be on display in the foyer during the the 14th Todd-AO Festival. The Magellan will be accompanied by Orla Nielsen, Product Test Manager for Logmar Camera Solutions, Denmark. The Magellan 65 prototype was presented in Hollywood in May, and cause a quite a stir among A-list cinematographers like Dutch-Swedish cinematographer Hoyte van Hoytema and Linus Sandgren. The Logmar Camera Solutions "Magellan" is a brand-new, fully electronic, hand-held and ultra-light all purpose camera which will take large format 65mm photography to a new level. The camera is Made in Denmark by Camera Engineer Tommy Madsen (CEO Logmar Camera Solutions), Frederikshavn, Denmark. 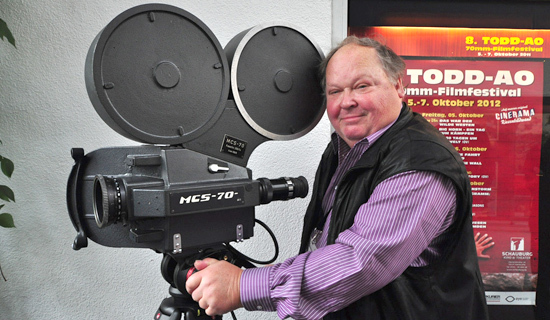 Jürgen A. Brückner and his vintage and original M.C.S.-70 Superpanorama camera. We are also pleased that Jürgen A. Brückner has accepted our invitation to bring his vintage MCS 70 camera for an encore visit. The previous visit in 2012 was a huge success among the audience. A great opportunity to see an authentic 65mm camera. 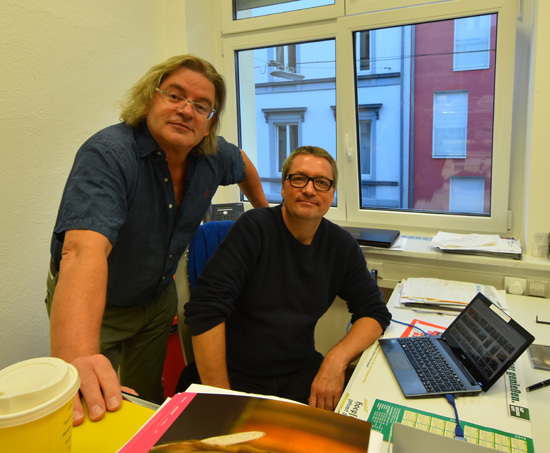 This camera was acquired by Jürgen A. Brückner of the Kinemathek Coburg, Germany in 2012. This original M.C.S.-70 Superpanorama camera, originally made by Jan Jacobsen in the early 1960s, will be on display in the Schauburg foyer Saturday and Sunday. Herbert Born, theatre manager of the Schauburg will again - personally - and with great skills, serve chilled Hoepfner Brau to everyone. The Get Together is always very popular, so be sure to stand in line. Our friend at Hoepfner Brau have have kindly sponsored the beer. Full weekend Schauburg 70mm Breakfast for festival pass holders in Schauburg Cinerama Lounge on the 1st. floor. Schauburg Kino's famous breakfast menu. Enjoy hot and cold with bread, pretzels fresh fruit. Hot sausages, scrambled eggs and bacon. Butter, honey and jam. Salami, smoked salmon, ham and apples served with juice, milk, coffe and the (green & black) and something for the sweet tooth too! 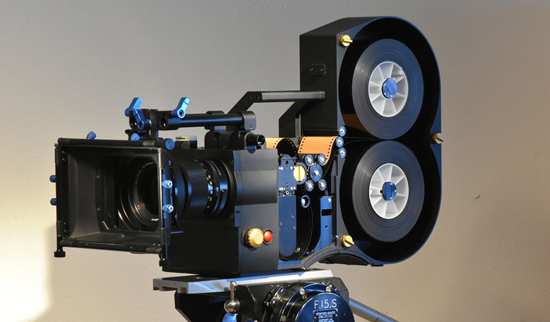 • 70mm projectors and 65mm cameras will be on display in foyer both Saturday and Sunday. Original title: Blade Runner / USA 1983. Filmed in Panavision 2;39:1 + special effects in 65mm. Presented in 70mm (2,20:1) / 6 track Dolby Stereo. German version / 117 minutes / Original premiere print. World Premiere: 25.06.1982. German premiere: 14.10.1982. Original titel: “Дерсу Узала”/ "Dersu Uzula" / "Uzala, der Kirgise” (2:24) + intermission. Filmed in: 70mm, 5 perforations, 24 frames per second. Principal photography in: Sovscope 70. Presented on: The curved screen in Sovscope 70 with 6-track magnetic stereo. Aspect ratio: 2,21:1. Country of origin: USSR. Production year: 1974 World Premiere: July 1975, Moscow. Danish premiere: 15.03.1976. West Germany premiere: 12.11.1976. Original title: "Hoffa USA 1992. Filmed in Panavision 2;39:1. Presented in 70mm (2,20:1) / 6 track Dolby Stereo. German version / 140 minutes / Original premiere print. Jack Nicholson, Danny DeVito, Armand Assante, J.T. Walsh, Robert Prosky. Original titel: "Murder on the Orient Express" / "Mord im Orient-Express" (114 min). Filmed in: 65mm 5 perforations, 24 frames per second. Principal photography in: Panavision System 65 (2,21:1). Presented: on the curved screen in Panavision Super 70 with 6-track DATASAT digital sound. Aspect ratio: 2,39:1. Country of origin: USA/UK. Production year: 2017. World premiere: 03.11.2017, Royal Albert Hall, London, England. German premiere: 09.11.2017. In the most timeless of whodunits, MURDER ON THE ORIENT EXPRESS follows renowned detective Hercule Poirot as he attempts to solve what would become one of the most infamous crimes in history. After a shocking murder of a wealthy businessman on the lavish European train barreling its way west in the dead of winter, private detective Poirot must use every tool of his trade to uncover which of the train’s eclectic passengers is the killer, before he or she strikes again. Published in 1934, Agatha Christie’s novel, Murder on the Orient Express is considered one of the most ingenious stories ever devised. More than 80 years after its publishing, Christie’s novel remains beloved by new generations of readers. Kenneth Branagh’s stunning retelling of the beloved mystery with its acclaimed ensemble and breathtaking visuals invites audiences to take the most suspenseful train ride of their lives. The level of detail was particularly important as the film was shot on 65mm, a format which heightens every element of the filmmaking process. "In our digital age, it's increasingly rare for films to be shot on celluloid, and mostly when they are, it's 35mm,” said Branagh. “We are shooting on 65mm. So, in crude terms, it's twice the size of the 35mm negative. It allows for a level of definition in the color and the range of tones and contrasts in the movie that, if you like film, some would argue, echoes more the experience of the human eye when viewing things. It essentially means, in layman's terms, that it looks sharper, richer, more colorful, and it feels like you're inside it. That's what 65mm does for me, and I wanted to take the audience onto the train. That's why we chose that format." Original titel: "Phantom Thread" / "Der seidene Faden" (130 min). Filmed in: 35mm 3 perforations, 24 frames per second. Principal photography in: Panavision System 35 (__:1). Presented: on the curved screen in blazing 70mm with 6-track DATASAT digital sound. Aspect ratio: 1,85:1. Country of origin: USA/UK. Production year: 2017. World premiere: 11.12.2017, USA. German premiere: 01.02.2018. Set in the glamour of 1950’s post-war London, renowned dressmaker Reynolds Woodcock (Daniel Day-Lewis) and his sister Cyril (Lesley Manville) are at the center of British fashion, dressing royalty, movie stars, heiresses, socialites, debutants and dames with the distinct style of The House of Woodcock. Women come and go through Woodcock’s life, providing the confirmed bachelor with inspiration and companionship, until he comes across a young, strong-willed woman, Alma (Vicky Krieps), who soon becomes a fixture in his life as his muse and lover. Once controlled and planned, he finds his carefully tailored life disrupted by love. With his latest film, Paul Thomas Anderson paints an illuminating portrait both of an artist on a creative journey and the women who keep his world running. Phantom Thread is Paul Thomas Anderson’s eighth movie, and his second collaboration with Daniel Day-Lewis. "The movie was shot 3 perf 35mm, which means you can't make prints without an optical. This means, to retain any quality they'd have to do a DI. For a true 35mm photochemical distribution from a 3 perf negative, this is the workflow: Cut OCN>3 perf IP> 3 to 4 perf blowup IN> release prints. So you'd be dealing with 4th generation for theatrical prints on 35mm. Where with a DI, you scan the negative and you laser out directly to 70mm IN. So release prints are being struck off a 70mm IN which for all practical purposes is an identical replica of the 3 perf 35mm negative. So you're dealing with prints made from 2nd generation, instead of 4th generation with the optical printing process. One could do an optical blow up directly from the negative, but the cost to do every single print that way, is exorbitant, so it's really never done." Original titel: "Playtime" / "Playtime - Tatis herrliche Zeiten" (126 min). Filmed in: 65mm 5 perforations, 24 frames per second. Principal photography in: Mitchell 65mm cameras. Presented: on the curved screen in 70mm with 6-track DATASAT digital sound. Aspect ratio: 1,75:1 Country of origin: France. Production year: 1967. World Premiere: 17.12.1967, Empire Cinerama, Paris, France. West German premiere 14.08.1968. Director: Jacques Tati. Script: Jacques Tati, Jacques Lagrange, Art Buchwald. Photography: Jean Badal & Andréas Winding. Music by: Francis Lemarque. Monsieur Hulot is on his way to contact an American official in Paris, but he gets caught in a tourist invasion and roams around the city with a group of American tourists, causing chaos in his usual manner. In true Tati fashion, we are shown Paris as a stylish maze of mid century modern architecture filled with the latest technological gadgets. Monsieur Hulot verliert sich im labyrinthartigen Paris. Umringt von Glaspalästen und Wolkenkratzern besucht er zuerst eine Ausstellungsmesse, später ein Nobelrestaurant, in dem es drunter und drüber geht. Meisterwerk! Unverständlicherweise floppte der Film in den Lichtspielhäusern, was Tatis Regierkarriere nahezu besiegelte. Die perfekt getimte „Choreografie des Chaos“ lässt einen Staunen. About the restoration of "Play Time"
"Play Time" was the only Jacques Tati movie shot for 70mm release. The original (1967) negative material was so worn and damaged that, by the year 2000, it wasn't possible to make new copies without some restoration being done to it. We had to repair the original film elements physically, using both chemical and digital methods, and also repair the sounds. We sought to restore this version of the film to correspond to Jacques Tati's original artistic vision. So, we had to search to find the lost parts of the film, in order to add them to the new 70mm prints. We had to be sure of the cuts Tati was forced to make. We did some research on all the documents we had from that era, and we could also refer to two 35mm copies from the Toulouse and the Lausanne cinematheques, which confirmed our thoughts. The new version is as long as the Toulouse version, about 2 hours 06 min, instead of 1hour 58 min. It's not as long as the complete original, but it was what we could locate and assemble. Jerome Deschamps, The Reconstruction of the 70mm print of Jacques Tati's "Play Time"
• La restauration de "Play Time"
• The restoration of "Play Time"
Original titel: "Ready Player One" (2:20) + intermission. Filmed in: 35mm 4 perforations, 24 frames per second. Principal photography in: ______________. Presented on: The curved screen in a new 70mm print with 6-track DATASAT digital sound. Aspect ratio: 2,21:1. Country of origin: USA. Production year: 2018. World World Premiere: 11.03.2018. German premiere: 05.04.2018. Original titel: 2OO1: A Space Odyssey / "2OO1: Odyssee im Weltraum" (149 min) + intermission. Filmed in: 65mm 5 perforations, 24 frames per second. Principal photography in: Super Panavision 70 (2,21:1). Presented: on the curved CINERAMA screen in Super Panavision 70 with 6-track DATASAT digital sound. Aspect ratio: 2,21:1. Country of origin: USA/UK. Production year: 1964-68. World premiere: 02.04.1968, Uptown Theatre, Washington DC, USA. West German premiere: 11.09.1968. The Running time of "2OO1: A Space Odyssey" is 2 hours 20 minutes, plus 10 minutes of OVERTURE, ENTRACTE and EXIT MUSIC. You begin with an artifact left on earth four million years ago by extraterrestrial explorers who observed the behavior of the man-apes of the time and decided to influence their evolutionary progression. Then you have a second artifact buried deep on the lunar surface and programmed to signal word of man's first baby steps into the universe -- a kind of cosmic burglar alarm. And finally there's a third artifact placed in orbit around Jupiter and waiting for the time when man has reached the outer rim of his own solar system. When the surviving astronaut, Bowman, ultimately reaches Jupiter, this artifact sweeps him into a force field or star gate that hurls him on a journey through inner and outer space and finally transports him to another part of the galaxy, where he's placed in a human zoo approximating a hospital terrestrial environment drawn out of his own dreams and imagination. In a timeless state, his life passes from middle age to senescence to death. He is reborn, an enhanced being, a star child, an angel, a superman, if you like, and returns to earth prepared for the next leap forward of man's evolutionary destiny. That is what happens on the film's simplest level. Since an encounter with an advanced interstellar intelligence would be incomprehensible within our present earthbound frames of reference, reactions to it will have elements of philosophy and metaphysics that have nothing to do with the bare plot outline itself. • Warner Bros. Pictures Celebrates 50 Years of Stanley Kubrick's "2OO1: A Space Odyssey"
Original titel: "West Side Story" (2:32) + intermission. Filmed in: 65mm 5 perforations, 24 frames per second. Principal photography in: Super Panavision 70. Presented on: The curved screen in a new Super Panavision 70 print with the original 6-track mix in DATASAT digital sound. Aspect ratio: 2,21:1. Country of origin: USA. Production year: 1961. World Premiere: Rivoli, New York City, USA, on 18.10.1961. West German premiere: 13.09.1962. • Wolfram Hannemann's 2009 Bradford introduction to "West Side Story"
Original titel: "A Year Along the Abandoned Road" (12 min). Filmed in: 65mm 5 perforations, 24 frames per second. Principal photography in: Super Panavision 70 with a 50mm lens. Presented on: The curved screen in Super Panavision 70 with 6-track DATASAT digital sound. Aspect ratio: 2,21:1. Country of origin: Norway. Production year: 1988-89, Shot on 180 workdays with 105 shooting days. World Premiere: June 1991, Grimstad, Norway. German premiere: 09.10.2005, Schauburg Cinerama, Karlsruhe. Directed by: Morten Skallerud. Main shooting crew: Frode Wik, Sklak Mienna, Svein Anderson and Knut Skoglund. Composer: Jan Garbarek. Dolby Stereo mix: Norsk Filmstudio, Oslo. Six-track mix for 70mm by: Pinewood Studios, England. Laboratory post-production by: Technicolor in London. Film stock: 65mm Eastman Kodak 5247 (day). 65mm Eastman Kodak 5297 (night). Making "A Year Along the Abandoned Road" had been a dream for many years, ever since January 1980 when I first came to a deserted, isolated, weather-beaten small village in Finnmark, located in northernmost Norway. Then the dream slowly turned into reality after we found a reliable method of doing extended tracking shots over rugged terrain, frame by frame. "A Year Along the Abandoned Road" is a nature animation film - a kind of time-lapse film in one single shot. We see the Arctic year passing by at 50,000 times normal speed, and at the same time we "fly" along the remains of a 2.5 kilometre internal village road. "A Year Along the Abandoned Road" is intended for large cinema screens. It was shot in 70mm, thanks to a sponsoring deal with Panavision. • Go to How Georg Fricker became the owner and operator of the last of Karlsruhe’s “picture palaces”.